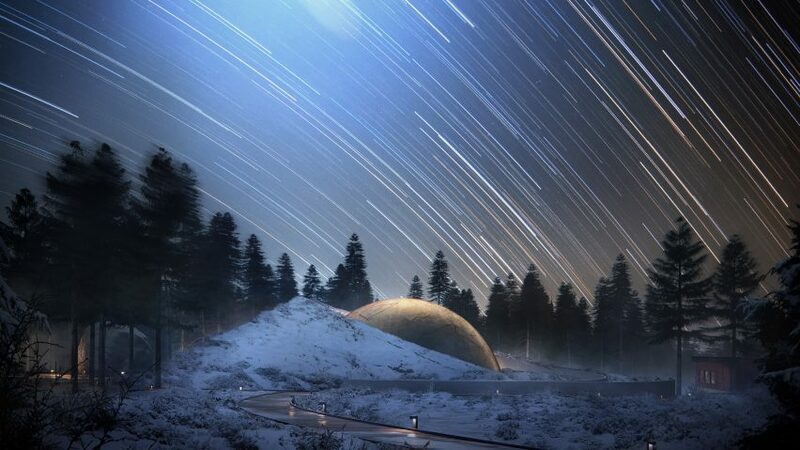 The golden cupola of Snøhetta's planetarium will be orbited by seven "interstellar cabins" as part of Norway's largest astronomical facility. Architecture studio Snøhetta has unveiled designs for the Solobservatoriet, which is to be built on the site of a current observatory. The Tycho Brahe Instituttet, named after the 16th century Danish scientist who founded modern observational astronomy, has commissioned the facility. When complete, it the facility that will primarily monitor meteor activity, earthquakes and climatic gases, will be the largest of its kind north of the Alps. Located 580 metres above sea level in the forests of Harestua, the three-storey celestial theatre will be half-way sunk into the ground, encircled by a living roof. Emerging from the earth, the gilded orb of the planetarium roof will be decorated with constellations carved into its surface. A swirling ramp leads round the dome of the 100-seater theatre to the exhibition spaces of the visitor centre below, which will also house a cafe and restaurant. Pathways will spiral out from the main planetarium to seven "interstellar cabins", which are not based on planets but rather imagined space objects, where visitors could stay the night. The largest cabin, at 10 metres in diameter, will be able to accommodate up to 32 people, with the smallest cabin, at just two metres across, able to sleep two. According to the architects, once the facilities are completed in 2020, the Solobservatoriet will be a "publicly accessible and international knowledge hub" that provides "expanded support spaces for activities such as team building, lectures and seminars". Snøhetta, which ranked at 27 on Dezeen Hot List 2017, has recently unveiled several out-of this world projects it has in the works. A ring-shaped hotel projecting over the water of a glacial lake in Norway's Arctic Circle is due to be energy positive, creating more energy than it could consume. In southern Norway the architecture firm, which has offices in Oslo and New York, has plans for Europe's first underwater restaurant, a semi-sunken concrete volume that will double as a marine research centre and artificial reef.